A (re)turn to the humanities? – Kristen D. Burton, Ph.D.
To say the humanities have taken a beating the past several years would be a glorious understatement. Slashed funding, shrinking departments, and the constant public rhetoric on STEM, “employable” degrees… the anti-humanities cycle continues to spin. As a result, college students are actively encouraged to avoid pursuing liberal arts degrees and instead focus on the degrees that “make sense” – you know, the ones that will land college graduates a job. This approach is understandable, as Scott Jaschik recently pointed out in Inside Higer Ed, the number of liberal arts majors tend to decline in times of recession. While the trend makes sense, the public discourse surrounding university degrees in the humanities has been brutal. These stories aren’t new. Each new development (Gov. Rick Scott’s plan to raise tuition for liberal arts majors, recent attacks on the education system in Wisconsin, and even backhanded remarks from the sitting President of the United States) seems to deepen the ever present sense of dread that seems to follow humanities advocates. That is, until recently. 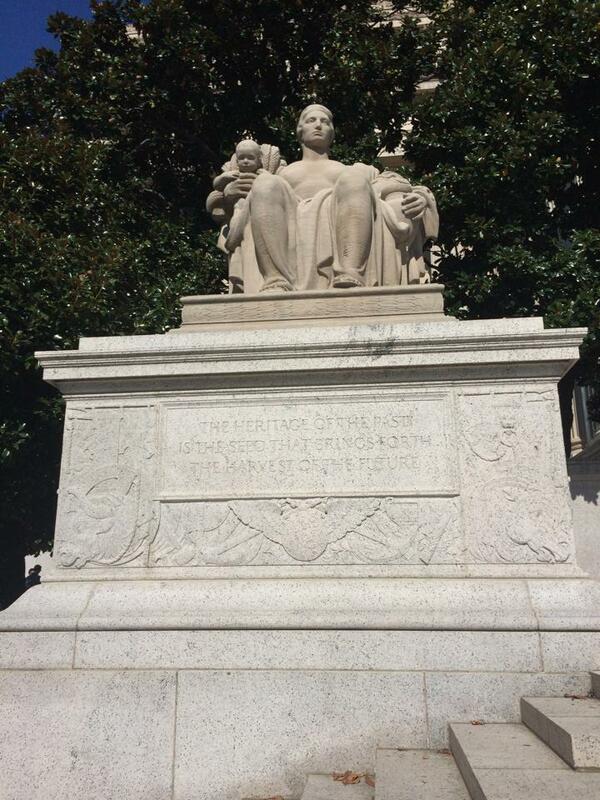 “The heritage of the past is the seed that brings forth the harvest of the future.” Heritage statue outside the National Archives of the United States. Last week, Forbes published an article on the value of liberal arts degrees in the tech industry (That ‘Useless’ Liberal Arts Degree Has Become Tech’s Hottest Ticket) that made waves across the Internet. Some responded to the article with surprise, but for those involved in the humanities, this news isn’t exactly… news. For for an industry dependent upon creative thought, appealing design, and finding new ways to make software and computer programs an intricate part of our daily lives, a humanistic touch is necessary. Drew Gilpin Faust, an historian and President of Harvard, recently dropped a perfect summation on the societal value of the humanities. The world needs scientifically sophisticated humanists and humanistically grounded scientists and engineers who can think beyond the immediate and instrumental to address the bigger picture and the longer term. The humanities are a indispensable component of higher education, and a foundational aspect of an educated populace capable of critical, creative thought. Every semester that I teach the introductory courses on the history of the United States, I face a challenge in which I must prove to a (usually substantial) portion of the class that the study of the past is essential. Students absorb the vitriol that surround public discussions about liberal arts degrees, causing some students to see taking courses unrelated to their STEM majors as frivolous. They perceive the study of history as disconnected from their lives, or their ability to engage in the world as an well-informed citizen, which could not be further from the truth. It is my hope that this recent turn in the nature of discussions about the humanities and the value of liberal arts degrees may alter students’ perceptions and increase enthusiasm for the critical knowledge and skills such degrees offer.